Once upon a time, way back in the 90s, Shawn was really involved in the world of the harp here in BC. She played at churches, weddings, funerals, schools, attended workshops and was a contributing editor to the BC Harps Newsletter. Since moving from Northern BC and picking up new hobbies, she’s let her harping slide (gliss?) and no longer performs publically. 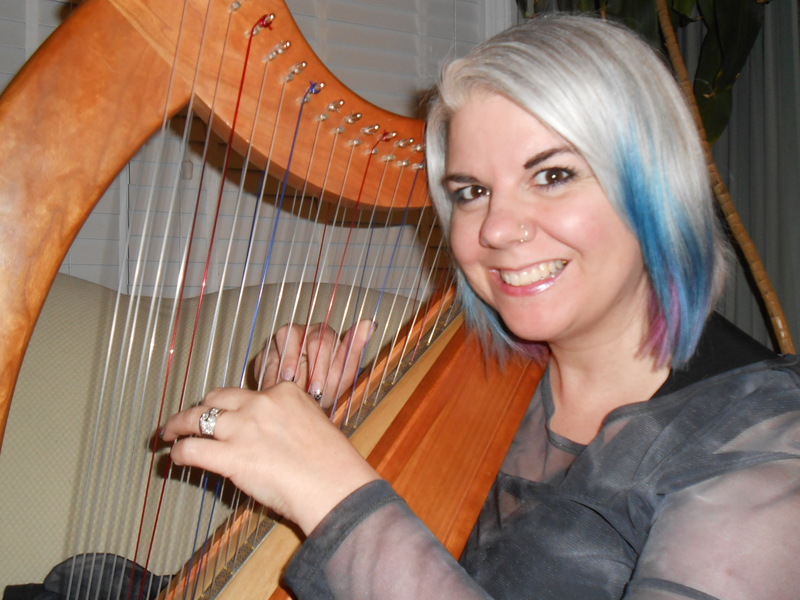 Lately, however she has had people asking her again for harp related information, so as a public service, she offers the following links to people and companies she knows and trusts within the harp world. This is not an exhaustive list, and is not meant to be so. Enjoy the links to the music and the talent of people who are far more dedicated to their practising than Shawn was ever able to be! She is also pleased to say that she has begun practising again, and may haul her harps to a writing venue near you. Probably not, but you never know! Kate Gibson-Oswald – Lake Country performer and harp teacher. 1/3 of Anamcara Harp trio. Alys Howe– Vancouver. I first met Alys when she was a talented high school student. Now she has a masters in Scottish harp and performs around the world! Delightful and talented young lady. Elizabeth Volpe Blighe – Vancouver Symphony harpist and UBC Music faculty member. Lori Pappajohn– Vancouver. Her Winter Harp concert series is a staple for many each Christmas season. These people aren’t from BC, but they come to BC to do workshops and they’re amazing teachers. I’ve studied with them and would recommend them both as teachers and performers if you have the opportunity to see them. Sharlene Wallace– Toronto area harpist Sharlene is my guru. I play her CDs all the time, and look forward to every opportunity she’s in BC. She trained on a pedal harp with Judy Loman at University of Toronto and plays in the Hamilton Symphony, but a trip to Wells to explore folk harp with Kim Robertson changed her life! We are all the better for it. 😉 Here is a clip of someone driving her horse, but the music is Sharlene- and better yet, it’s “Moving Cloud” a tune I am still working on whenever I find myself in need of a challenge. I love to hear whenever I can! Kim Robertson– she is impressive! Her “Moving Cloud” duets with Sharlene at Wells still make me beam! Here’s a lucky thing- I found a YouTube video of Kim playing “Moving Cloud” Although the same tune, and I think even the same arrangment (I think we all learn from Kim’s book “Treasures of the Celtic Harp”) it’s quite different from Sharlene’s version- faster for one thing. Thormahlen Harps– Oregon. Dave Thormahlen is the builder. Not a BC outfit, but I’ve met Dave’s wife Sharon Thormahlen,and my raving critique of her Thormahlen Swan is still on their website! Very drool-worthy sound and beautiful instruments. As well, Sharon composes the most incredibly beautiful tunes for folk harp- simple yet really lovely. I have always received lots of compliments whenever I’ve played her tunes! (Her book “Rose in Winter” is my favorite). Dusty Strings Harps– Seattle. They are a full service harp related retailer and often host concerts and workshops in the store as well. Northwest Music– Vancouver, BC. Not a harp specialty shop, but they’re the closest big store for most BC musicians. They sell harps and harp music. Their catalogue is quite exhaustive with titles, but provides no/little detail about the music. North Arts Heritage Music– Salmon Arm Harp builder and repairs, music, and ecoutrements. Josephus Harps– Duncan, BC (Vancouver Island) Marilyn and Joseph have been involved in the BC harp scene for years. They used to live in Wells, and Marilyn is instrumental in the development of Island Mountain Arts’ harp school. Their Dayspring harps are well respected, and they have a string program. Their thorough website provides links to the Canadian harp scene. Melody’s Traditional Music and Harp Shoppe – Houston Texas – does a thriving mail order business in harps and all related paraphernalia. Their rating system for music books is phenomenally useful, and if you email them with specific info about your playing abilities (“I can’t change levers on the fly, but I can play most Sylvia Woods books” for example) and your harp (full levers tuned in Eb, no levers and tuned to C, etc) they will recommend books for you or tell you if a book you’re considering is something that is appropriate for you. They’ve never been wrong yet! Their catalogue is a thing of beauty- entertaining and informative. I still read 15 year old versions for the information! If you scrolled this far, you might be wondering if I have any tunes for you, now that I’m practising again. As it happens, I do. 🙂 Here I am, with an arrangement I made of The Skye Boat Song. 😉 If you go to YouTube you can even find a few more. 😉 I’m only recording with the camera and mic on my little notebook computer, so I apologize for the quality. Sold? AHHHHH! The pain! Sylvia Woods Teach Yourself book is really great, and there are seasonal workshops for from beginners to pros to fill in the gaps. PS I have an Aunt Leona- a rare name! And, in addition you play a harp … remarkable! I’m glad you enjoyed it. If listening was soothing, you should try playing. The sound vibrations align cells and offer therapeutic properties. Many music stores offer rentals to explore the instrument. I recommend Island Mountain Arts; they have beginner workshops (and usually some rentals) each August.